So, my movie would be called the “Day the Garden Stood Still” with heavy undertones of an evil plot and ugly men/corporate villain types who refused to listen to climate change warnings and destroyed the world. People now live among broken electronics that are spewed all over the ground. Those nasty ugly corporate men control the food chain. The FDA is no longer around (as if it really mattered) and everything contains BPA in it. The world is a plain mess. Okay. Back to our heroine. She would be ageless, raw, and without make-up because all the factory who made chemically toxic make-up no longer existed. No one had heard of the likes of Revlon, Estee Lauder or Lorelle. In fact they never heard of Latisse where woman had unnaturally thick eye lashes with weird colored irises. The world would be full of plastic huts, which would be this civilization’s answer to homes. Tons of plastic was leftover from decades ago. Instead of letting it litter the street, they made good use of it to make their homes. Plastic bags were used for curtains. Our sea life was no longer since they ate too many of those bags. The heroine of the movie’s clothing would be made out of vintage polyester from the eighties since polyester didn’t decompose and was readily available. Her skin would show signs of vitamin deficiencies since no one ate real food anymore. Everything was made out of GMO soylent green (a la Charleston Huston’s movie.) Maybe to be original, we could use the name Monsanto green. All the alfalfa had been turned to GMO so our cows had five legs. Our Angie heroine braved the freezing temperatures to dig up the last beet, leek, and cauliflower, and plucked the seeds from the calendula, dill, and fennel. No one had never heard about natural remedies. The world was counting on her. Angie enters the garden and the plot thickens. She is amazed of the garden’s awesome beauty and what Mother Nature had created. She swore she even saw a bee, which she had heard about when she was young. Human kind kills them off long ago, and then flowers stopped growing. As she reaches to touch a leaf ….. I am glad I woke up because “that movie world” was too scary for comfort. Let’s keep on our toes to make sure our world is the one we want for our children. 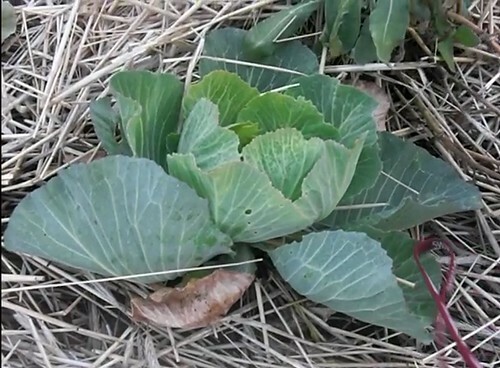 Enjoy the winter garden video, and be thankful that more and more people are growing their own veggies. Are you a nut like me and garden in the freezing weather? Are you cooking something awesome with root veggies and if so share the recipe. If a movie was made of your life, who would you want to play you? Who would play your significant other? What would your worse environmental nightmare be?